With a ton of energy and a tiny tummy, your toddler needs at least two, or maybe more, snacks per day. Snacks should provide nutrients to support energy needs, growth and development and health and well being. Snacks should come from real food, in its natural state. I am not a big fan of the quick toddler snacks you will find down the baby food aisle, I just think we can do so much better for our children. So with that in mind, here is a quick toddler snack to provide quality nutrients and energy. Remove the pit from a medjool date. Carefully fill with nut or seed butter, close and serve. It really couldn’t be any easier. 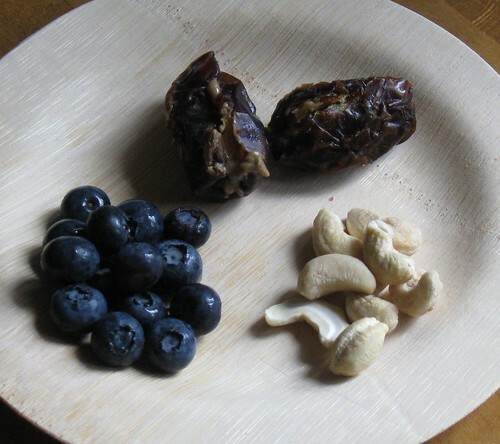 We served ours up with some fresh organic blueberries and raw organic cashews. Delish! Hope your toddler (or you, this makes a great mom or dad snack too) enjoys it! This entry was written by Melissa, posted on November 9, 2011 at 4:08 am, filed under Feeding Weaners & Families, Wean Team and tagged children nutrition, toddler snack. Bookmark the permalink. Follow any comments here with the RSS feed for this post. Comments are closed, but you can leave a trackback: Trackback URL.